This makes a great gift to hand out to the kids on Christmas Eve! Thanks to Renee for sending in the "Winter Rabbit" version for those who don't celebrate Christmas... She wrote "As I went to do it this year I realized that a few of my students did not celebrate christmas and may not want to make it. (1 friend said that he wanted to make it and was going to give it to a friend of his! :) ) I came up with my own template with a winter rabbit instead. If you would like me to send you my template, I would love to share it with others, since I have gotten so many good ideas from here! Let me know and Happy Holidays!! :)"
sprinkle of red or green sugar crystals (for cake decorating). Optional: You can cut a circle of cloth or felt a bit larger than the lid. Place over the lid and tie a ribbon around it to decorate. We actually used Kleenex cut in a circle and tied on with wool for the top of our lid and it turned out really nice. 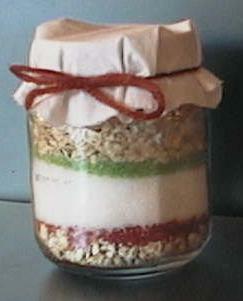 If you use a baby food jar, you can layer the ingredients for a "sand art" look like we did in the photo.